Subscribe to our new Definitive newsletter: High grade digital marketing guidance, topically sorted, and curated to the max. You pick the categories, we deliver the content. The best content from around the web, on topics you care about and need to be an expert in. In my ongoing quest to have chicken served in every conceivable way, courtesy of banquet chefs at events from sea to shining sea, I’ve fallen into the habit of repeating myself. While my social media speaking engagements vary enough that I alter my material quite a bit from event to event, there is definitely a batch of one liners that I tend to incorporate. They are either memorable, instructive, or both (hopefully). Event attendees often ask me if I have them written down, and I never have, until now. I am not proclaiming that I own any of these, or even that they were originally mine, only that they are the ones that I actually use day-to-day. What others are floating around out there? Leave them in the comments, and I’ll expand the collection. 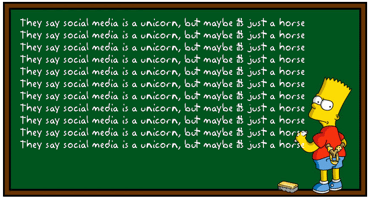 Everyone says social media is a unicorn, but maybe it’s just a horse? Focus on how to be social, not on how to do social. Social media doesn’t create negativity, it uncovers it. Social media is the ultimate canary in the coal mine. Social media is an ingredient, not an entree. Passion is the gasoline of social media. The goal of social media is to turn customers into a volunteer marketing army. Activate your fans, don’t just collect them like baseball cards. It’s not viral unless it is. Social media allows big companies to act small again. Facebook Fan Pages are email newsletters with smaller pictures. Social media changes the relationship between companies and customers from master and servant, to peer to peer. You must fight social media fire with social media water. Every company is its own TV station, magazine, and newspaper.